The largest market in the collection market, Tian Huangshi weighs 34,000 grams worth tens of billions. On September 29, 2012, in Xiamen, the â€œPuriation Guaranteed Repurchase â€“ National Stone TreasuresÂ·Foyuan Ink Art Auctionâ€, the last piece of the 1725 grams collected from Japan was called â€œthe largest Tian Huangâ€. Bai Tianhuang caused buyers to compete. Eventually, a 40-year-old investment and collector from Beijing received a price of 392 million yuan, which triggered the earthquake in the Shoushan Stone Collection. At present, a large Tian Huangshi with a weight of 34KG and a size of 44Ã—30Ã—22cm was discovered from a senior collector of Tian Huangshi in Fuzhou, the origin of Tian Huangshi. According to the old gentleman, the Tian Huangshi he collected is a red field. It was transferred from a collector many years ago. If you look at the value of Tian Huangshi's color, the red Tian Huang is the best, and since ancient times, it has never been found such a large Tian Huangshi. Now it can be said to be He is unparalleled in the world and worthy of the city. For this reason, he intends to declare the Guinness World Record "World No. 1 Tian Huang". This Meitian Huangshi color is red and yellow, and the skin, ribs and silk are clearly visible. According to the transaction price of â€œthe largest Tianhuangâ€ Baitianhuang on the â€œNational Stone TreasuresÂ·Foyuan Ink Art Auctionâ€, the transaction price is 392 million yuan. The unit price is about 227,000 yuan per gram, then the value of this block yellowstone is about 7.7 billion yuan, plus the recent 20% price increase in the Tianhuangshi market and the characteristics of the largest red field in the world. It is worth noting that it is worth a billion. "This red rice yellow weighs 34,000 grams, is the largest Tian Huangshi discovered so far. Tian Huangshi can be so big that it can be said to be unprecedented. After that, there are many collectors and investors who have expressed great interest in it. Some buyers even want to buy a few buyers to buy it as an investment method. According to the industry, the real value of this Tian Huang is mainly due to its scarcity. "Tian Huang was originally scarce, originally. There are very few current worlds. This red rice yellow is the largest found so far. If the texture stone skin is present, the radish is clearly visible, which is a rare treasure. According to reports, Tian Huang is only produced in Tianzhong, a small square of less than one square kilometer in Shoushan, Fujian Province. Moreover, development has been banned at present. At present, the total mining volume of Tianhuang is less than 1 ton. All the sales related to Tianhuang are limited to this range. Inside, collectors are generally not willing to sell, and it is rare in the market. 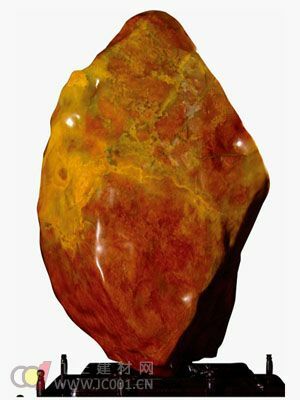 Small information: Hongtian stone is also known as "orange peel red stone". It is an orange-red field stone, a rare species of Tianshi. Its color red is slightly orange-yellow, such as ripe orange peel, or like rotten persimmon, bright and bright, hence the name. It is especially rare for its pure color. Gong Lun's "Shoushan Stone Spectrum" said: "(Tian Shi) Red is absolutely unique, not seen for decades." Redfield stone, the texture of the clear is called "red field frozen." There is another kind of original Tian Huangshi, which is turned into red by fire and is aliased to "ç…¨çº¢ç”°çŸ³".